Wayne Cilento - Call on Dolly! Wayne Louis Cilento is a Tony Award winning dancer and choreographer. He is best known for originating the role of "Mike" in the Broadway show A Chorus Line, and later becoming one of Broadway's most prolific choreographers. He won a Tony Award in 1993 for choreographing The Who’s Tommy on Broadway. Wayne started dancing when he was eighteen in high school in the Bronx. He did two musicals around that time. His original career choice was to become a pharmacist but changed his mind. Though he attended one dance class when he was seven or eight, the teacher zeroed in on him; he panicked and didn't return. When he was in high school, he saw the original production of Cabaret and was so taken with the show, he decided "I really could do that." He auditioned for his high school musicals, got the dance leads, and started taking dance class twice a week. He continued to study dance in college where he met his mentor Bill Glassman of the American Ballet Theatre. "Bill was short and straight--someone I could use as a role model." His first summer after completing his freshman year in college, he started auditioning and got Hello, Dolly, his first summer stock job. The choreographer was George Bunt who has since passed away. George did not recreate Gower Champion’s original choreography. At that time, Wayne knew what Hello, Dolly was but wasn’t familiar with Molly Picon. He had met Rick Atwell prior to this. This was an interesting experience for Wayne but he was “green”. Years later, Jerry's Girls was choreographed by Wayne and opened on December 18, 1985 at the St. James Theatre, home of the original Hello, Dolly, where it ran for 141 performances. Wayne considers Jerry Herman a “very interesting man.” It is very interesting choreographing to his music. As bold as he is and as theatrical as he is, Wayne couldn’t do anything subtle. Wayne eventually went along for the ride. He tried doing subtle things in his choreography with Chita Rivera. With every number, Wayne had to go back and change it to fulfill what Herman’s music is. There were no conflicts. Dorothy Louden and Leslie Uggams was stopping every show. Chita was doing a really good job. Wayne takes full responsibility for that. It was because he was going for more subtlety rather than BIG like “kickline” stuff, meaning pizzazz. He had to push to that level. Once Wayne fixed that, Chita was fine. It was an incredible production with those ladies. Molly Picon was a sweet sweet lady. Theirrelationship was strictly on a professional relationship and did not remain friends after this production. She was a charming old lady who had that charisma to carry off Dolly Levi. Of course, Dolly has to have that magical charisma. Molly possessed the foxiness that Dolly needs to get away with what she does. Wayne feels that she did a great job. Wayne was a featured dancer and he and Rick Atwell had a special bit in the title song. Rick was the assistant choreographer and Wayne feels that it was great at the time to be picked out for their bit together. Wayne considers Rick a terrific dancer. Dolly left an impression on Wayne because it was his first professional job. Being his first job, the choreography was challenging, but it was good. Also in that company was Beth Fowler and she and Wayne have gone on to do other things together. Not long after he married high school sweetheart Cathy Colety, Cilento made his Broadway musical debut in the chorus of Seesaw in 1973.This marked his first exposure to working with Michael Bennett as choreographer. He worked on the infamous Rachael Lily Rosenbloom and Don't You Ever Forget It, where he met many of his future A Chorus Line co-stars, and Gower Champion's Irene when he was invited to attend Bennett's workshop sessions of A Chorus Line in 1974-5. As a member of the original cast of A Chorus Line in the role of "Mike", the straight, short, athletic and aggressive dancer, it was based on Cilento's own personality. He introduced the song I Can Do That, although the specific story was actually that of another performer, Sammy Williams. One of the larger roles in the show, he was a standout and received much attention at the time. During the development of the show, the creators also toyed with Cilento having a second solo titled Joanne about his first crush on a girl (done in a Gene Kelly style dance), and appearing as a backup dancer for 'Cassie's' nightclub act, which was later cut. Along with the rest of the cast, he is featured on the iconic marketing materials for the show, and he won the Theater World Award for ensemble in 1976. His next project was the ill-fated The Act with Liza Minnelli, but he made a stunning return in Bob Fosse's dance revue, Dancin'. This intensive dance concert-style show earned Cilento his first Tony nomination for Best Featured Actor in a Musical. Cilento enthused. "In A Chorus Line people were standing around talking about dancing, here we were actually dancing!" He appeared in Fosse's next project Big Deal, as well as the Frank Loesser revue Perfectly Frank, and the lead in the tour of the Jack Cole musical Jack. He also had a small role in the film Annie with Anne Reinking and Pamela Blair. Appearing in Hello, Dolly with Molly Picon was one of Wayne’s first jobs in the theater. Wayne has really been blessed in his career to do great work with great choreographers. The overall influence of Dolly propelled his career. Wayne enjoyed Dolly but when it ended, he moved on. He really hasn’t thought much about Dolly until this interview. He has never even seen another production of Dolly. He did see the film which he thinks is amazing. Wayne was twenty two when he appeared in this production of Hello, Dolly! He was green and terrified and glad that he did it and went back to school. He did do Dolly again with Janis Paige. Wayne feels that Hello, Dolly has its place but should not return to Broadway. He thinks it is a beautiful show but is tired of revivals. He would like to see new works produced on Broadway. 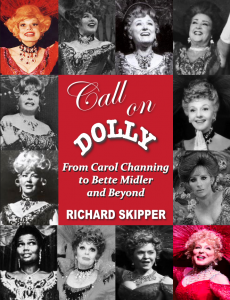 Hello, Dolly, interestingly enough, has never been revived on Broadway beyond Carol Channing and Pearl Bailey. As of this writing, the Signature Theater is mounting a full scale production in Washington DC starring Nancy Opel. Rumor has it that director Eric Schaeffer is doing a complete re-thinking of the show. The question is why mess around with an iconic show? Audiences know what they hope to expect when they go to see a show like Dolly. The Goodspeed Opera House is doing a production for their next season, first time it has been done there! Baayork Lee is staging an all Asian cast in a concert version to be performed at the Signature Theater in NYC on April 29th and May 6th starring Christine Toy Johnson and directed by Lee Roy Reams. As of this interview, Wayne is living in Westchester and is choreographing a movie called A Winter’s Tale for Marc Platt. He is going to Stratford, Canada to redo Tommy which is supposedly coming in to New York. He is working on the Bruce Lee project. He is also working on a Tupac project. It is a very good and eclectic period in Wayne’s career these days.